It therefore called for calm and restraint on all sides, a reduction of tension and greater communication between Shi’ite members and government authorities. A statement from the US embassy’s Information Office on Friday in Abuja said the Shi’ite group, like other religious communities, had the right to assemble, peacefully express their religious beliefs, and mark their celebrations. It said, “The US is deeply concerned by the deaths of dozens of Nigerians during clashes between individuals participating in a Shia procession and the Nigerian Police Force in Kano State on November 14. The US also called on members of the IMN and all citizens to respect the rule of law and cooperate with the police in their attempt to maintain public order. 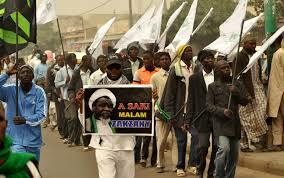 It urged the government to ensure accountability for the deaths of more than 300 IMN members during December 15, 2015 clashes between the group and security forces in Zaria, Kaduna State. “We also call on the Nigerian government to conduct a transparent investigation of the latest incidents and bring to account anyone responsible for violating the law,” the statement added.